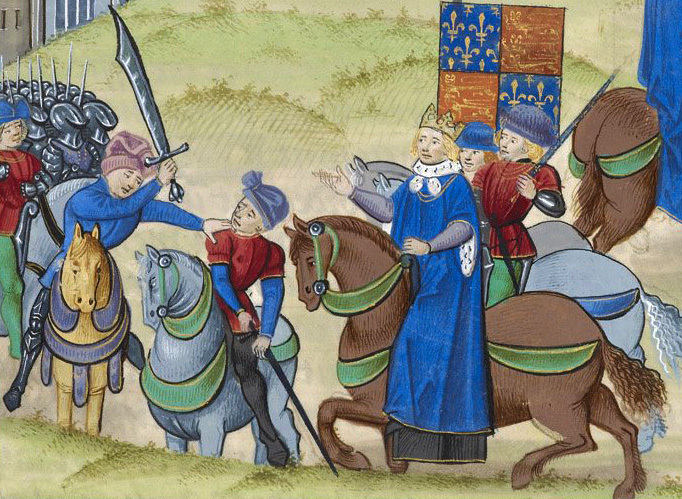 Wat Tyler gets bedazzled and be-deaded by the king and his retinue. Recently, Juliet Barker gave a talk at a history weekend in England on The Peasants’ Revolt. Short summary for those of you not familiar with the Peasants’ Revolt of 1381. It took place in the reign of Richard II at the end of the 14th century. By that time, the population of England had been decimated by successive waves of plague. As a result, social lines had been shifting. The aristocrats had a “how are you going to keep them down on the farm” after all the other serfs had died problem. Some farm laborers, serfs and freemen, were looking for higher wages elsewhere. Then, John of Gaunt, the king’s uncle, tried to raise taxes for national defense via a poll tax. He actually set it up to be fairer to the poor but as a result, the nascent middle classes got squeezed and carried the heaviest burdens. The middle stratum saw itself caught between the landed class that wanted labor to go back to the way things used to be before the shortage of labor brought on by the plague, while at the same time paying for their defense network. There’s more to it than that and Barker doesn’t delve too deeply into all of the political and social causes that lead to the revolt. If you’re interested, you can read her book or check out Tony Robinson’s documentary on the subject on YouTube. Barker says that it’s a myth that the revolt started in Essex. It was nationwide. The peasants had a lot of scores to settle. What I found most interesting was the story she told of William Grindcobb of St. Albans. Back then, the priories were landlords and also had tenant farmers and serfs working of them at subsistence wages. The prior of St. Albans had denied his tenants the use of hand mills to grind their flour, confiscated the hand mills and required all tenants to grind their grain at the priory’s more expensive flour mill. It also denied Grindcobb his claim of land and that he was a free man. Essentially, the priory turned him back into a serf. Grindcobb was a literate man with some degree of advanced education. He petitioned the king regarding his right to land and freedom. The king ruled in his favor. Grindcobb presented his documents to the prior. As a result, Gridncobb, and several other petitioners, were executed by the priory as an example to other potential upstarts.These nonviolent rebels were hung and the priory had ordered them not cut down before the corpses had rotted. But the bodies were cut down and buried. So, the priory ordered the corpses dug up and rehung. Barker says the queen eventually put a stop to the desecration of the bodies by the priory of St. Albans. In the lead up to Wolf Hall, I’ve been trying to figure out why the Dissolution of the Monasteries didn’t pique the ire of more average people. The monasteries were some of the only places where charity was distributed in England in the 16th century. They were also some of the only places where education was offered. This was especially the case for women who went through a sort of educational wasteland after the Dissolution. But now that I’ve heard about how the priories had the ability to abuse the general workforce, I’m not surprised that so few people stuck up for them. In protest, there was the Pilgrimage of Grace in the north but, in general, people didn’t seem to be too upset to see the monks go or to see their property confiscated. Henry VIII may have acted out of revenge and greed but many people may have felt the monasteries had it coming. They had grown rich off the labor of ordinary English people and they didn’t feel they were accountable to anyone but the Pope in Rome. So, they lost their property. Karma and all that. Not that anything like that could happen now. Besides, Richard II lied to the leaders of the Peasant’s Revolt, went back on all his promises, and had the leaders executed. From what I can remember, Wat Tyler et al got all deferential and awed by the power of the king when they finally met to issue their demands. While Tyler and his rebels were star struck by the celebrities, the king moved in for the kill and the aristocrats regained the upper hand. It’s -2 Fahrenheit. Time to put the baby outside for a nap. It’s tradition there to stick the kid outside in the pram for a brisk 2-3 hour nap in subzero temps. Check out this BBC Soundcloud for all the facts. Of course, if you are in Finland, you will have received a Baby Box when your kid was born, containing snowsuit, mittens, hats, sleeping bag, etc, so you can safely leave it outside without worrying about it turning into a totcicle. 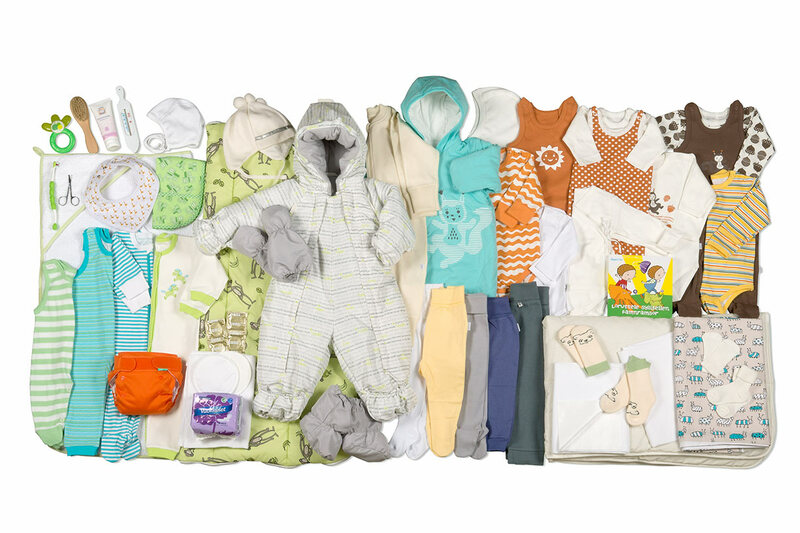 Here are the contents of a typical official Finnish Baby Box that every Finnish kid gets just for being born. Yes! Even the rich babies get them. They have no idea whether they’re going to grow up to be parasites on society. Americans are cautioned not to do this. The neighbors will report you to CPS.